Oppo’s name may not have the same recognition in the smartphone world as Samsung, HTC, or Nokia, but thanks to the decision to sell its Find 5 device in the US and Europe through its own website, it’s gradually growing in stature. 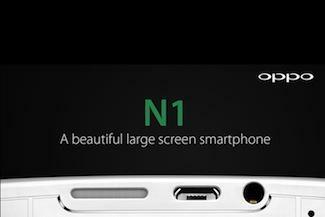 Now, it has confirmed a new device named the Oppo N1, which will launch in September. The phone has been leaked, and is expected to be Oppo’s attempt to grab a piece of the camera phone action. This week, through its official Facebook page, Oppo confirmed the N1’s existence and its arrival next month, but didn’t provide any detail. However, this message was followed by a teaser image letting us know about at least one of the N1’s headline features. You can see the image above, and it’s not very subtle. Remove Oppo’s wording and you’ve got a picture that belongs on the cover of a risqué romance novel. Anyway, as you can see it says, “Don’t just touch the front, the back is also interesting.” It then adds, “Rear touch panel. A brand new user experience.” So, the Oppo N1 is going to have a second touch panel, but on the rear of the device. Adding controls to the rear of a phone is suddenly very fashionable, after LG debuted the G2 with its rear-mounted volume controls. Since then, we’ve seen a leaked picture of the HTC One Max with what could be a fingerprint scanner below the camera lens. Back in February, we got some hands-on time with the Yotaphone, which has an E Ink screen on the back. Oppo’s teaser makes the N1 sound closer to the Yotaphone than the G2, as it has a small touch sensitive panel below its rear screen. It’s going to be very interesting to see what Oppo comes up with for the N1, and what exactly the touch panel will control. In addition to the rear touch system, the N1’s camera has caught our attention, thanks to talk of a special N-Lens and a new imaging chip called OWL. We’re wondering if it has anything to do with DigitalOptics’ Lytro-like Mems|cam, which allows you to focus on different points in a picture after it has been taken. Oppo is one of the companies said to be interested in DigitalOptics’ tech, which will go into production soon. While this is speculation on our part, the Oppo N1 and its rear touch panel is real. Now all we have to do is wait for its official announcement.